Still on the hunt for the location of the default startup config file on my pet Cisco ASA 5505. Can’t find them with show flash, show disk or dir commands. Google’s uncharacteristically unhelpful. A couple of search engine results allude to disk0:/.private/startup-config but I can’t display the contents of that path. So I get a Phillips-head and start unscrewing. I know, it’s like Galen of Pergamon dissecting a man to find the seat of the soul. But I’m going to remove the internal flash card and then hook it up to a compact flash reader. See if there are any hidden files that the ASA’s operating system is not displaying. I’ve never opened up this model of ASA before. The act of opening up the chassis of any new machine always evokes a minor anticipatory tingle. Part curiosity, part dread. What’s inside the box? The Heisenberg dead cat ick factor is an ever-present possibility. (From time to time, in the pursuit of data recovery, I’ve had to harvest hard drives from elderly servers that were decommissioned and then stored in a rodent-friendly environment. You’d be surprised how many animals are small enough to nest inside a partially-disassembled rackmount server.) But I’m looking forward to seeing the motherboard layout on this guy. The 5505 has such a small footprint. 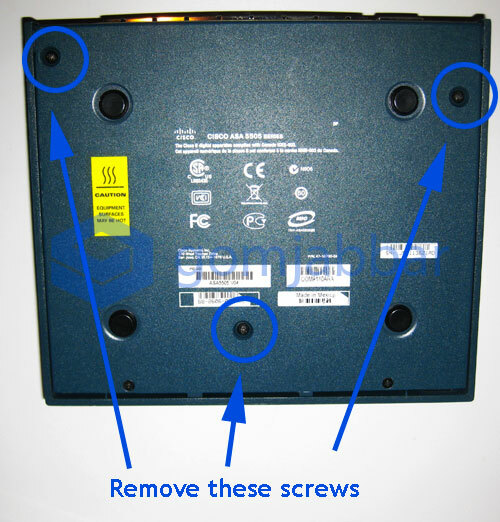 Anyway, I remove 3 screws from the bottom of the ASA 5505. There are a couple of plastic protrusions (along the vertical edges of the cover at the rear) that are holding the chassis cover to the main body of the ASA. Just pull the rear sides of the cover slightly apart from the body to free the cover. The insides look like what you’d expect. Compact, economical. Like a micro ATX box. Or a 6 tatami flat in Tokyo. A stick of RAM at the top of the picture, Compact Flash on the right. Lithium battery right next to it. Space for a Security Services Card (SSC) to be slotted in. 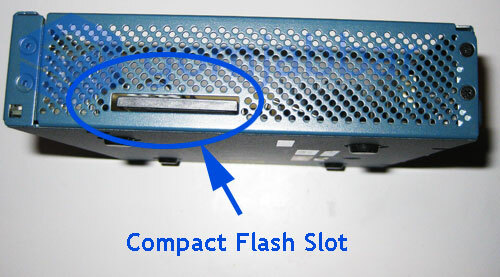 The Compact Flash card is not listed as a field replaceable unit in the 5505 Hardware Installation Guide. The Compact Flash card can be winnowed out of a small slot along the side of the ASA. 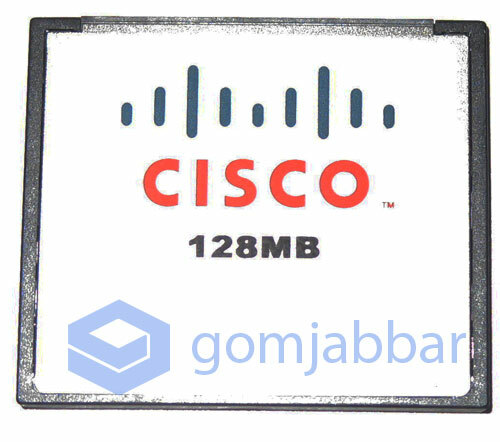 It’s a regular Compact Flash card with a Cisco badge on it. When the Compact Flash card is connected to a Compact Flash card reader and mounted on a Windows 7 computer, its filesystem is shown as FAT. 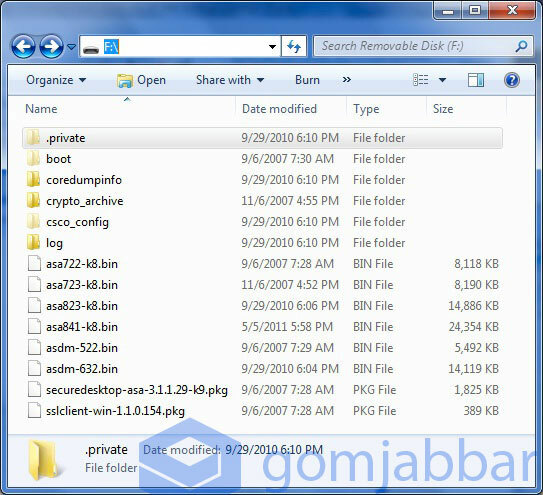 The top-level directory in the Compact Flash shows the same file listing as what was displayed with a dir command on the ASA. After changing the View settings to disable Hide Protected Operating System Files, 3 more directories are now visible, including the .private directory that I was trying to access earlier from the ASA. Inside the .private directory, there are what are presumably license files and the startup-config file that I was looking for. 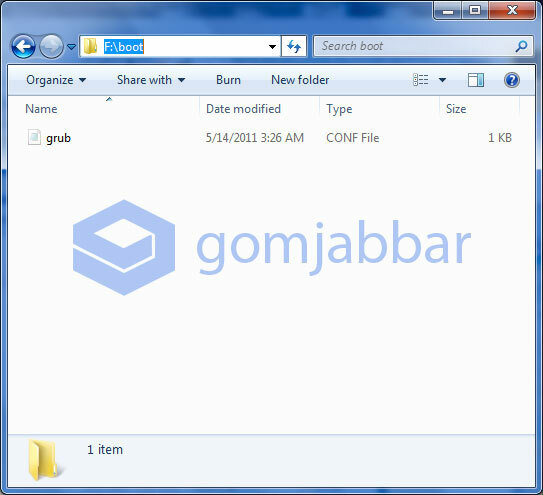 Inside the boot directory, a lone file named grub. So, the ASA uses a GRUB bootloader? Show disk command in the Cisco ASA 8.4 Command Reference. 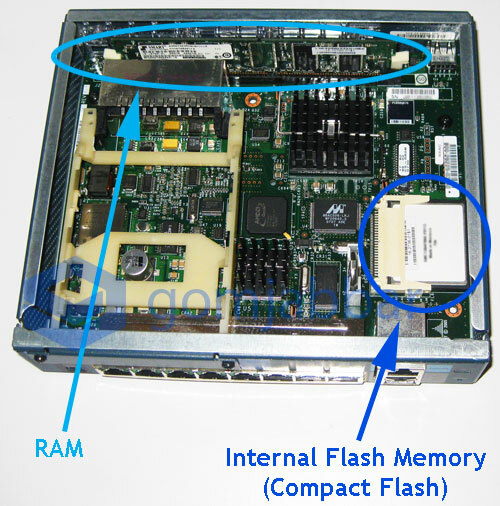 Show flash command in the Cisco ASA 8.4 Command Reference.